Good Choice Reading: Dark Triumph by R.L. LaFevers Blog Tour - Outtake & Giveaway! Dark Triumph by R.L. LaFevers Blog Tour - Outtake & Giveaway! 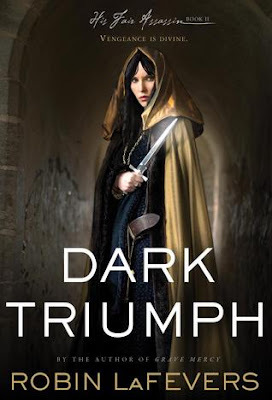 Welcome to our stop on the Dark Triumph Blog tour! We are so happy to be a part of this blog tour! We bring you "OUTTAKE #4"
When we wake in the morning, Sybella is gone. That thought has us both dressing as quickly as we can. We leave our room and head for the refectory, Annith accosting the first nun she sees. “Where is she?” Annith demands of Sister Widona, who is just returning from the stables. Annith stares at the nun a moment longer, then storms from the room. With a backwards glance that I pray appears apologetic, I follow. With growing alarm, I realize Annith is heading for the reverend mother’s office. “Are you sure this is wise?” I ask, but she ignores me and raps smartly on the door. “Come in,” the reverend mother calls out. Annith strides into the room. I am close on her heels, unsure what she is planning and hoping it will not get us in trouble. “Where is she?” Annith demands. My heart falters at her tone. I could never speak thus to the abbess, but then I have not been raised here since birth. Annith looks down at her feet, but her eyes still burn with outrage. Annith is shocked into silence. Clearly in all her years here and with all her small transgressions, no one has ever spoken to her this way. R.L. LaFevers (Robin Lorraine when she’s in really big trouble) grew up surrounded by shelves of old dusty books and a passel of brothers. She has also spent a large portion of her life being told she was making up things that weren’t there, which only proves she was destined to write fiction. 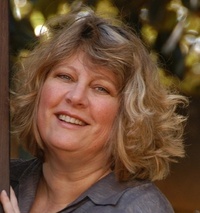 She is the author of over fourteen books for young readers, including THEODOSIA AND THE SERPENTS OF CHAOS, (Houghton Mifflin, 2007) which received starred reviews and was a Junior Library Guild selection, a Booksense Summer Pick, and nominated for the Malice Domestic’s Agatha Award, and the NATHANIEL FLUDD, BEASTOLOGIST series. Her first young adult novel, GRAVE MERCY, will be published by Houghton Mifflin Harcourt in Spring of 2012. She currently lives with her husband and a demonic cat in Southern California and spends her days gazing longingly at ancient artifacts or wallowing in old forgotten texts. For more information on Robin and her series you can follow her on: her website | blog |twitter | facebook. Awesome giveaway. I so can't wait to read this. So excited for Robin's success. My students and I loved the first book. We can't wait for the next installment! So excited for this sequel! I just stumbled upon Grave Mercy and loved how different it was from anything else I've read lately. Great giveaway! Wow, this is quite a prize! Thanks so much for hosting! Eeeeep I'm so excited for this book!!! :) I was a little wary when I saw it was a companion book because I really wanted more of the first book, but I've only heard good things about this one. Great outtake! I miss Ismae's POV. . .
Another fabulous outtake. You're absolutely killing me here!!! Interesting outtake! I loved Grave Mercy and I thought Sybella was an intriguing character! Can't wait to read her story! Love outtakes! More more! I can't wait to read on Sybella's POV and what's next in the story. thanks for the great post! Congrats to Robin on her newest release! Looking forward to Dark Triumph! THANK YOU for participating in this tour. Grave Mercy is an all time favorite, and I have no doubt that Dark Triumph will join it shortly! Loved reading all of the outtakes! Can't wait for Dark Triumph!! This makes me more excited! Love love Grave Mercy. Can't wait for Dark Triumph! I feel like this is a great tease for Annith's story to come-loved the first two books and excited to read hers too!